Google recently started rolling out a new Gmail contacts interface that includes new sorting features, keyboard shortcuts, improved labels, and more. There are also a few new changes to the overall look of Gmail that makes it easier to quickly access your contacts and tasks list. Let's take a look at the new features. At the top of the Gmail inbox is a new "Mail" link that takes you to your inbox when you click on it. Strangely, the Mail link does not include a count of your current unread e-mail. For that, you'll still have to refer to the Inbox link below. 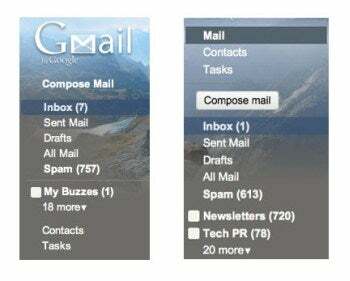 Old-style Gmail and the new version. Underneath Mail are links to your new contacts and tasks lists. Clicking on tasks works just as before and brings up a small window with your to-do list. If you don't want to see your contacts and tasks, you can hide them by clicking on the minus sign to the right of your Mail link. One final change is that the Compose mail option has been upgraded from a text-based link to a button, making it easier to see. The biggest change Gmail has implemented is a completely overhauled look to the contacts manager (click on the image above to see how it's laid out now). Your contacts are now organized horizontally across the screen similar to how your e-mail looks in Gmail. At a glance, you can see a contact's name, e-mail address, phone number, address, and the names of any groups you've assigned to your contact. 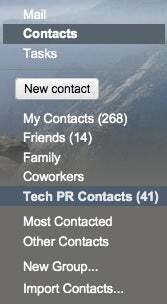 Above your contacts list are several drop-down menus for easy access to basic contact management functions. You can add people to groups, import and export contacts, merge contacts, check for duplicates, print and options for sorting your contacts by first or last name. The left contacts panel has also been overhauled.At the top is a button to add a new contact, and below that are links to your contact groups as well as the option to create new groups. There's also a link to a list of the people you contact most often, and another link for any contacts that are not assigned to any of your groups. 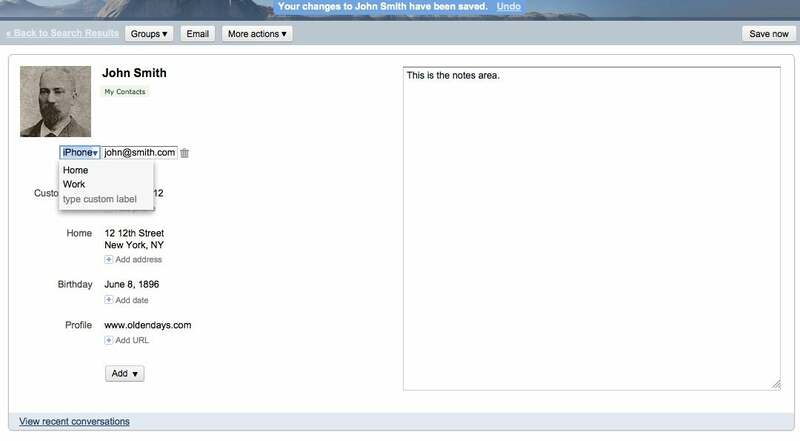 Clicking on any of your contacts will bring up a new contact page for that person with their photo and name at the top. (Click on the image at the left to enlarge it and see the new contact page.) This is followed by listings for their e-mail accounts, home and work addresses, phone numbers, and URLs for that person's Web site, blog, or social networking account. If you want to create a custom field, just click on the "Add" button at the bottom of the page. To the far right of the basic contact information is a large notes area, where you can enter any information you want as basic text. If the notes area is too small just click on the bottom right corner of the notes window to expand it. On the bottom left of the contacts page you will also see a link to view recent e-mail and instant message conversations you've had with that particular contact. You can also customize all label fields on a contact's page. Say you wanted to differentiate between a friend's iPhone number and a standard feature phone they sometimes carry with them. Just start typing 'iPhone' in the field you want to change, and you're done. If you want to quickly get rid of the edit you've made, you can click on the undo link at the top of the page. On the top right, there's also a save button, but Gmail contacts now autosave the minute you move your cursor away from the field you're editing. So you don't need to worry too much about saving your changes. Another new feature is the capability to use Gmail keyboard shortcuts while in the contacts interface. To see a complete list of shortcuts available just press "?" on your keyboard. The revamped Gmail some nice new features that will make it easier to organize your contacts. It's also a nice touch that the new contacts interface brings your address book in line with the rest of the Gmail interface. The revamped Gmail is currently rolling out and you should see the new interface soon if you haven't received it already. However, Google Apps users won't be seeing the Gmail refresh just yet. Google says it is "actively working on making domain-specific features work well in the new interface." But the company promises Google Apps users will get the new features soon.